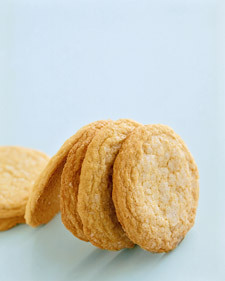 This recipe and photo is from Martha Stewart. I thought if you’re going to buy a bag of expensive sanding sugar, you may as well have at least TWO cookie recipes on this blog that use it. Here’s one. Preheat oven to 350 degrees. Sift flour, baking soda, and salt into a bowl; set aside. Scoop dough using a 2-inch ice cream scoop; space cookies 2 inches apart on parchment-lined baking sheets. Flatten cookies slightly with a spatula. Sprinkle tops with sanding sugar, then lightly brush with a wet pastry brush; sprinkle with more sanding sugar.